Yet another reason why I love Skylanders, and Activision . ON April 2nd, which is World Autism Awareness Day, Skylanders will release a line of Blue and White Skylanders! We want everyone to "Light it up Blue" with these limited edition Skylander's and have fun while supporting a great cause! Read all about it below! SANTA MONICA, Calif. – February 29, 2016 – To support the millions of families affected by autism, Skylanders®, the beloved kids videogame franchise, and Autism Speaks, an organization dedicated to autism science and advocacy, invite fans to “Light it up Blue” with one-of-a-kind toys. Through this creative collaboration for April’s Autism Awareness Month, Skylanders and Autism Speaks are raising awareness for an important cause -- and in true Skylanders fashion, are having fun while doing it. The new series of Skylanders SuperChargers toys are blue and white to reflect Autism Speaks’ official colors. The “Power Blue” Skylanders SuperChargers feature Splat and Trigger Happy, as well as their SuperCharged vehicles Splatter Splasher and Gold Rusher -- all of which appear in-game as their special colors. The toys are on store shelves now at participating retailers in the U.S. and Europe and will be available starting April 1 in Canada. “When my son was diagnosed with autism, I felt very alone. 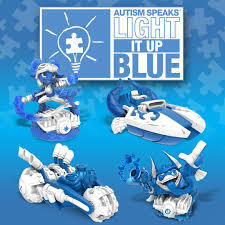 From my first Autism Speaks Walk, I felt the power of community, and this partnership with Skylanders will bring awareness and belonging to kids and families in a unique way,” said Matt Asner, director of Corporate Development, Autism Speaks. In addition to creating the Power Blue Skylanders SuperChargers and bringing them to life in game, Activision Publishing, Inc., a wholly owned subsidiary of Activision Blizzard, Inc. (NASDAQ: ATVI) is launching employee education and employee-donation matching programs in connection with Autism Awareness Month. Additionally, in recognition of World Autism Awareness Day, employees will have the opportunity to participate in the Autism Speaks Walk on April 2 at the Rose Bowl in Pasadena. Activision is also making donations to non-profits that are making a difference in the autism community. For more information please visit https://www.skylanders.com/ or follow us on Instagram @SkylanderstheGame, Twitter @SkylandersGame and Facebook.com/SkylandersGame. Assets for Skylanders SuperChargers are available at http://press.activision.com. Headquartered in Santa Monica, California, Activision Publishing, Inc. is a leading global producer and publisher of interactive entertainment. Activision maintains operations throughout the world and is a division of Activision Blizzard (NASDAQ: ATVI), an S&P 500 company. More information about Activision and its products can be found on the company's website,www.activision.com or by following @Activision. Cautionary Note Regarding Forward-looking Statements: Information in this press release that involves Activision Publishing’s expectations, plans, intentions or strategies regarding the future, including statements about Skylanders’ collaboration with Autism Speaks are forward-looking statements that involve a number of risks and uncertainties. Factors that could cause Activision Publishing’s actual future results to differ materially from those expressed in the forward-looking statements set forth in this release include unanticipated product delays and other factors identified in the risk factors sections of Activision Blizzard’s most recent annual report on Form 10-K and any subsequent quarterly reports on Form 10-Q. The forward-looking statements in this release are based upon information available to Activision Publishing and Activision Blizzard as of the date of this release, and neither Activision Publishing nor Activision Blizzard assumes any obligation to update any such forward-looking statements. Forward-looking statements believed to be true when made may ultimately prove to be incorrect. These statements are not guarantees of the future performance of Activision Publishing or Activision Blizzard and are subject to risks, uncertainties and other factors, some of which are beyond its control and may cause actual results to differ materially from current expectations. © 2015 Activision Publishing, Inc., SKYLANDERS, SKYLANDERS SUPERCHARGERS, SWAP FORCE, LIGHTCORE and ACTIVISION are trademarks of Activision Publishing, Inc.
²Based on revenue from January – July, 2015, according to the NPD Group, GfK Chart-Track, and Activision Blizzard internal estimates, including toys and accessories."